Gluten Free & Vegan Spinach Risotto ~Yum! Melt spread in a risotto pan on medium low heat, or saute pan with a 2.5in side. Add diced onion and cook until lightly browned, then add minced garlic. Next add your arborio rice, stirring until your rice becomes translucent. Poor in two cups water lower heat to low and allow to simmer while slowly adding the remaining two cups of water. 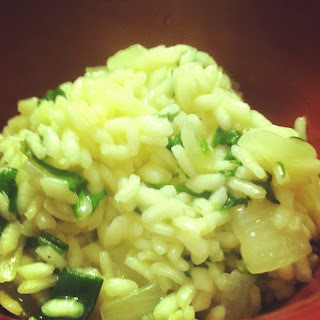 once your rice begins to turn into a creamy texture, add your chopped spinach and allow to simmer for another minute. If necessary add the extra 1/2 C of water. Remove from heat and add desired amount of salt & pepper, now serve with chopped parsley on top!